Liu He, member of the Political Bureau of CPC Central Committee, listens during the annual meeting of the World Economic Forum in Davos, Switzerland, Jan. 24, 2018. Speaking at a forum on the Chinese Economy at the World Economic Forum, Liu He said China would take steps to open up the banking, finance and insurance sector as well as the manufacturing and service sector and other measures. “Many of our foreign friends have asked, you’ve made so many promises, but when will they be carried out? I can responsibly say that we will carry out these promises one after the other, the sooner, the better,” Liu said. China has long promised to open up its markets to the world, but the slow pace of reform in some sectors and a playing field that is tilted heavily in the favor of state owned enterprises and forces players to hand over technology in exchange for market access has increasingly been the focus of criticism from foreign firms in recent years. It was unclear from his remarks how some of that might change, but analysts note that what Liu has to say is important. Late last year, he was elevated to a seat on the 25-member politburo of the Communist Party of China. He is also widely expected to become China’s next vice premier in March with a portfolio that focuses on the economy. He said that as China marks 40 years of opening its markets up to the world, reform measures fitting to commemorate and celebrate that occasion would be unveiled. In his remarks, Liu He said China would focus on continuing to open up in four areas: finance, manufacturing and services, boosting intellectual property right protection and expanding imports. For manufacturing, that would include shipping, rail transit and equipment manufacturing and reducing restrictions on foreign investment. 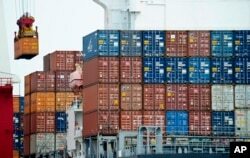 On imports, Liu noted that last year China reduced tariffs on 187 products, cutting the average from 17.3 percent to 7.7 percent. He said such moves would continue. In recent years, China has come under increasing criticism from the United States and other countries over its trade practices. Automobile tariffs are one area of concern. Imported cars currently face a 25 percent tax coming into China, while Chinese automobiles that are shipped to the United States face a 2.5 percent tax. In his speech Liu He repeated an earlier promise to gradually lower tariffs on imported automobiles, but gave no specifics on a possible timeline. On the campaign trail, U.S President Donald Trump promised to put more pressure on China and as Beijing continues to delay on promised reforms, trade war clouds are looming. 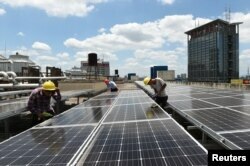 FILE - Employees install solar panels at a roof of Yiwu International Trade City in Yiwu, Zhejiang province, China, July 17, 2017. Earlier this week, he announced heavy tariffs on solar panels and washing machines — a strike at China’s economy that some analysts argue is just the beginning. Trump will speak on Friday at the meetings in Davos and here in China his appearance at the gathering is being used as a way of contrasting what some argue is a sharp difference in world views between the two countries. 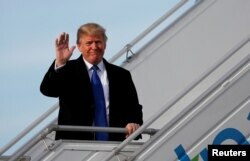 U.S. President Donald Trump waves as he arrives in Zurich, Switzerland, Jan. 25, 2018. 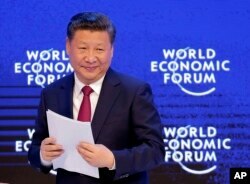 FILE - China's President Xi Jinping looks on at the World Economic Forum in Davos, Switzerland, Jan. 17, 2017. The idea of a community with a shared future was put forward by China last year, when Chinese President Xi Jinping became the first head of state to attend the forum. When he speaks on Friday, President Trump will be the first U.S. leader to speak at the meeting since former president Bill Clinton.